A variation poker game, Casino Hold’ Em online casino game is played on a felt green-topped card table with relaxing background music to simulate the experience of real live poker play. It’s a game of skill where you decide what and when to gamble but don’t worry. You can learn by playing for fun if you’ve not played before. 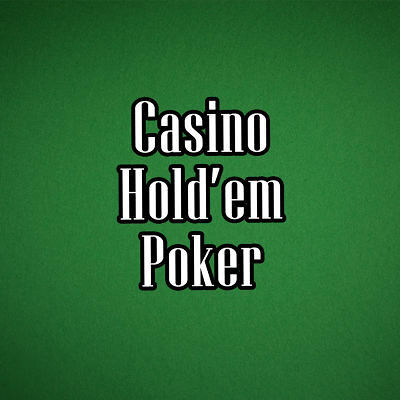 And if you like playing poker for real, you’ll love Casion Hold ‘Em. Founded in 1996, Swedish game developer, NetEnt, is licensed in Malta and since 2006 have grown in popularity to become one of the besk known slot developers in the world. Employing over 1000 people globally, they deliver premium content to many of the world’s most well-known online casino operators. You play the game against the dealer and place your bets on the Ante and AA Bonus if you want. After the first round you can receive winnings from the AA Bonus. Casino Hold ‘Em uses the standard pack of 52 playing cards to randomly deal two hole cards to you two to the dealer and three community cards in the centre of the table. Standard poker hand rankings are used in calculating wins - Royal Flush, Straight Flush, 4 of a kind, Full house, Flush, Straight, 3 of a kind, 2 pairs and 1 pair. So see what you can make from the two cards you are dealt and the community cards dealt in the centre of the table. If you think your two cards combined with the three community cards, makes a good poker hand you can click Call which places a second bet on the Ante and a further three community cards are dealt. The winner is whoever has the best poker hand. If it is you, you win your bets otherwise you’ll lose them to the dealer. Select your chip size (1, 5 or 10). Make your bets in the Ante and optionally on the AA Bonus. You’ll get two cards face up and the dealer gets two face down. Three cards (Flop) are placed face up in the middle of the table. Either,click Call to place a bet double the Ante and display two more community cards (the Turn and River), making five cards altogether in the centre of the table. Does the dealer’s hand qualify to continue playing? Yes if he has a pair of 4s or higher. Otherwise you win. Are your cards and the dealer’s the same? Known as a Push, neither of you wins and you don’t lose your bets. Does the dealer have a better hand than you? If so, he wins. Or, click Fold to end the round, giving up your bets to the dealer. Casino Hold ‘Em is a slick introduction to the world of online poker and you can play for fun or for money.